Seems only last week I was complaining about how wet it was. Well, I'm still complaining – not that there's much anyone can do about it. The standing water in the fields has disappeared and we're able to get some field work done. It's about time as we're prepping and planting all at the same time. When I started here, this spot was covered in ground hemlock. 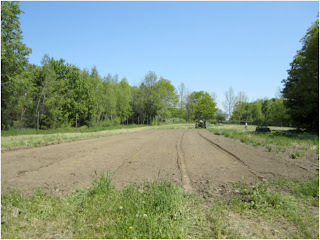 We cleared it and moved the topsoil from the pond site here and to make a field. A few years back, we removed some nearby pasture pines and now have a small, sunny and workable field. We're preparing to seed chives and parsley and also to plant the asparagus trial. Here we're applying lime, Sul-po-mag and Micro Start 60 pelletized chicken manure. 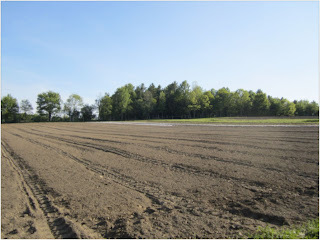 This field will be 95 percent tomatoes this year. After this photo was taken, the field was chisel plowed and left for a few days. Once the sun comes out again we'll bed it and lay plastic mulch. Lots of field work being done now to get ready for the bulk of the transplanting, which starts in earnest next week. I'll take some more photos for next week; until then enjoy the planting. Organic Gardening Magazine recently ran a detailed article on sunflowers. 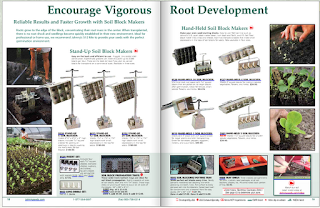 The article offers insight on which areas are most successful at growing the flowers, as well as light requirements and the best way to prepare the seeds. "Varieties thrive largely as annuals in all USDA Plant Hardiness Zones, from Alaska to Hawaii. After all, this plant, made iconic by Dutch painter Vincent van Gogh, was first cultivated in the American Southwest around 1000 B.C. 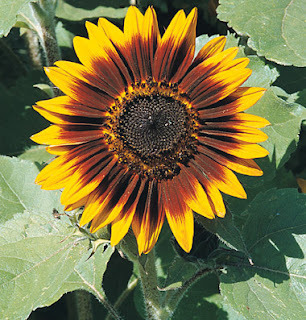 and developed for commercial use in the mid-1800s in Russia... Today, Russia, Ukraine, and below-the-equator Argentina are among the largest growers of sunflowers in the world." "Despite their bright collars of petals, sunflowers, which come in single- and multistem varieties, aren't really single flowers but 1,000 to 2,000 individual flowers. The ray petals around the circumference have no stamens or pistils. Their function is to attract pollinators to the landing pad or "disk," since sunflowers rely heavily on bees and other pollinators to reproduce..."
Rick Kelley, a self-described “pepper-head” from Greenfield MA recently wrote in to tell us about his experience using Johnny's mulch. 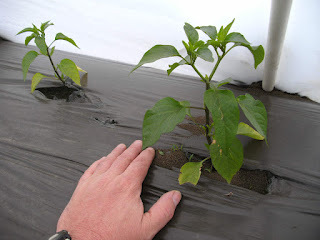 Rick says, "I planted about sixty chiles, eggplants and tomatoes into ground covered by it on Monday of last week, then covered it with a low hoophouse, and the plants have been loving it." "I started the seed in early February indoors under lights so they got a good start, but they needed to go into the ground, and your product made that possible." 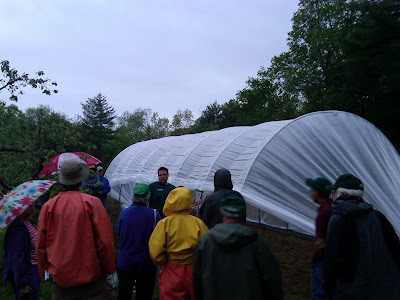 On May 15th, NH territory sales rep Chris Hillier and I traveled to Tuckaway Farm in Lee, NH (Seacoast area) to do a presentation organized by NOFA NH called ‘Small Equipment Demonstrations for Vegetable Farmers - Part II’. We were not involved in Part I, which was centered around larger equipment. 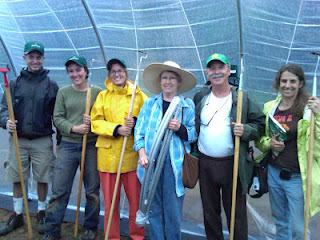 When we first got there around 12:30 p.m., we met owner Chuck Cox, who showed us to the plot where we would be building a demo tunnel. We got to work right away setting up a 12' x 28' caterpillar. By 3:30, we had it ready to show. We then set up the bender demo area with a picnic table we had brought from Maine. Since the weather was iffy, we assembled the hand tools and seeders on a hay wagon, so that we could quickly bring them in the barn in the case of a torrential downpour. Around 4:30, people started showing up. There were probably around 35-40 attendees with and without umbrellas. As they made their way in, we had kind of a free-for-all with the hand tools, as they got to try them out in a weedy patch of the field and express which were their personal favorites and why. A little after 5:00 Ray Conner, the Beginner Organic Farmer Program Director from NOFA NH welcomed everyone, and got the show started. Chris went first, giving a brief overview of all the hand tools and seeders, with a promise to answer any specific questions after. This was great because she gave a very quick, comprehensive overview of the lines, what is available, and what the products’ individual strengths are. After that, everyone assembled on the hill for the caterpillar tunnel demo. 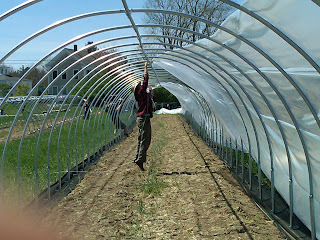 I started by bending a 6 ft hoop for low tunnels, then a hoop used to make high tunnels. We then moved over to the tunnel plot. I spoke about what we had done this afternoon to get the tunnel to the state that it was in. I enlisted some help from the crowd to insert and connect the last bow, cut the protruding ridge pole off, and then skin and lace the tunnel. After that Dorn Cox, who is a board member for the National Young Farmers Coalition, gave a brief invitation for everyone to check out their affiliated site, Farmhack.net for innovations in tool designs. Finally, we invited everyone inside the tunnel and drew names for the raffle. We intend to repeat this same talk on August 1st at Alchemy Gardens in Shrewsbury, VT. 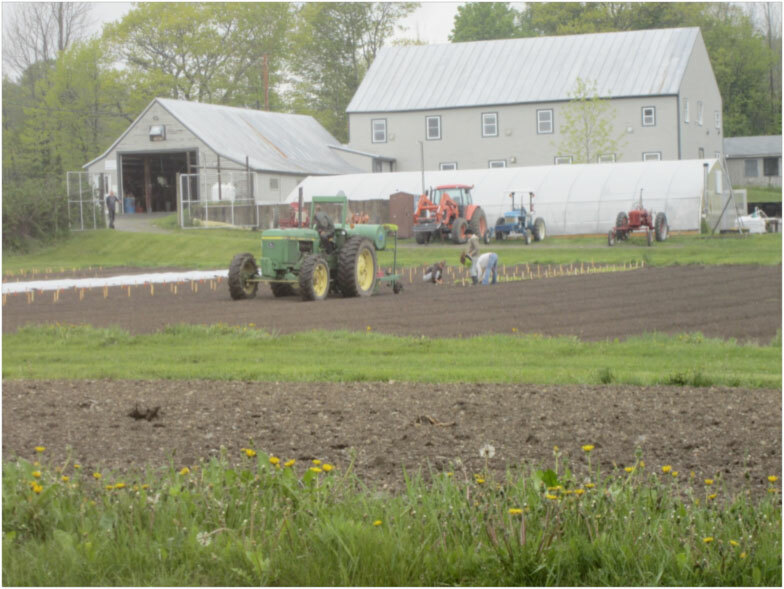 The talk will tentatively be held from 4:00 to 6:00 and will be presented through a collaboration of NOFA VT and RAFFL (Rutland Area Farm and Food Link). The most challenging part of farming is scheduling everything in. 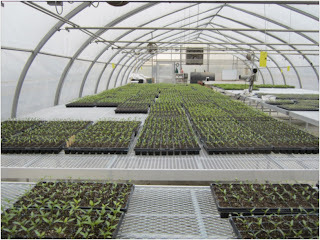 Planting in the greenhouses is all fine and dandy until they start to overflow - then where do we put everything? Anyone who has a greenhouse knows this time of year that space is at a premium and there’s never enough. Of course, once the plants go out into the field there’s some empty space there. Another challenge is what to do with the greenhouses after the big spring push is over? Plenty of seedlings ready to go. We grow seedlings most of the season, first for the bulk of the spring planting, to summer crops to fall crops and finally to crops we’ll grow all winter. 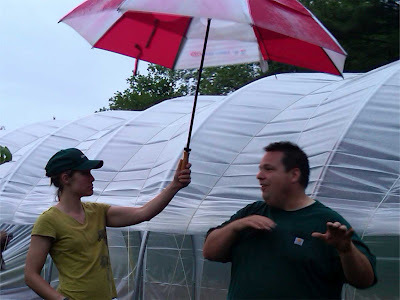 In the summer we grow tomatoes in some of the greenhouses along with special projects like ornamental containers and fun projects; things we can experiment with and don't take up any space in our busy season. 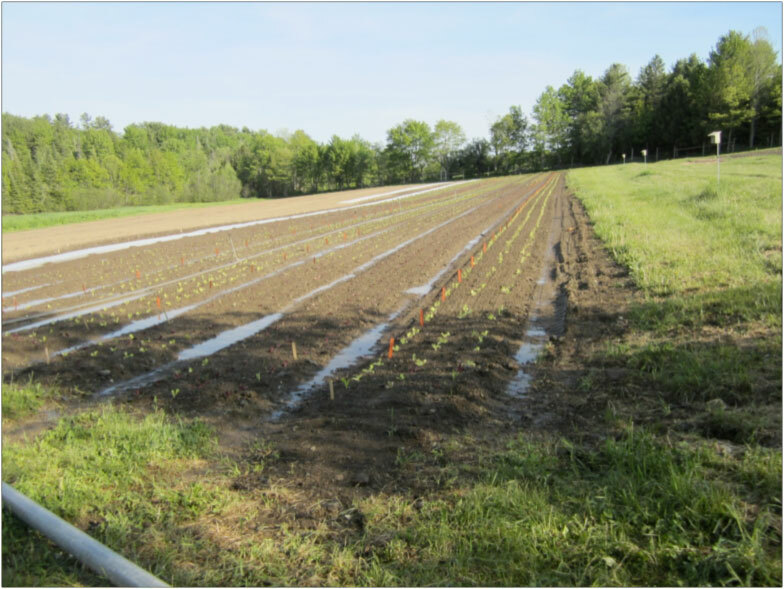 Spring Chinese cabbages are under the row covers for protection from flea beetles. Stakes have numbers on them which correspond to a numbered system for keeping track of which variety is which. Keeping all 14 people we have on the crew busy this year is challenging when we can’t get out into the fields. Normally we’d be making beds and laying plastic all over the place right now. With 11 different fields we rent or own we’re going all over the place at any given time. Until it clears off we’ll be cleaning and painting and organizing things so when we want to go we’ll be ready. We’re ready all right; right now would be good. That’s it for now. The weather looks good after today. Next week’s column should see lots of field prep pics. Labels: Weather, What's new at the farm? The word "greens" includes many leafy green plants (and a few that are gold and purple). They are vitamin-rich and important in many cuisines around the world. Many types are best grown in the cool weather of spring and fall, and in the winter hoophouse, but there are others that can be planted and harvested throughout the summer. If you sell in an area where lettuce is the most exotic green, begin your greens program by offering arugula. This spicy/peppery green is popular throughout the United States and is increasingly available in supermarkets, either alone or as part of a salad mix. The flavor gets stronger as leaves increase in size. There are two types of arugula, the salad type and the wild type. 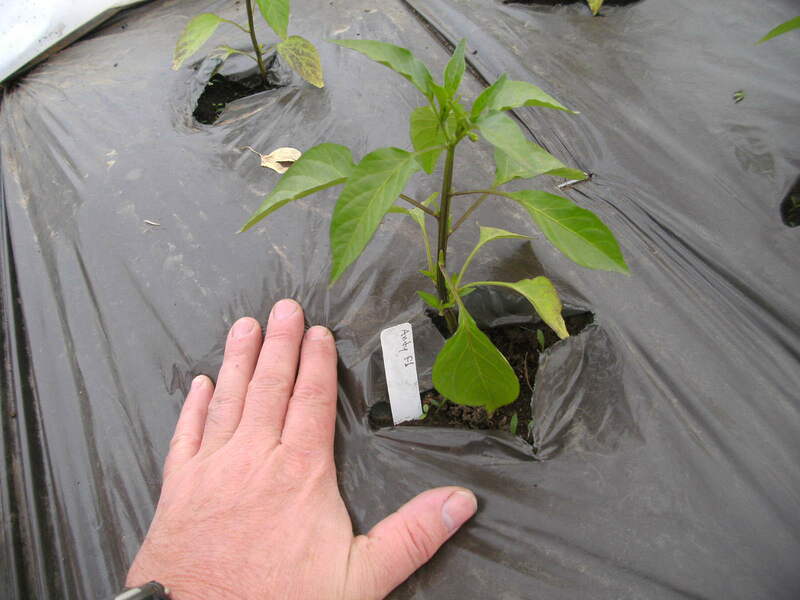 The salad type has broad leaves, a vigorous growth rate, and is ready for harvest in 21 to 40 days from direct seeding. It can be sold in the baby leaf stage as a salad green or grown to maturity for bunching. The wild type, Sylvetta, typically has narrow, lobed leaves and a slower growth rate, requiring 50 days to harvest. It is more pungent and therefore more suitable for mixing with other greens in a salad mix. 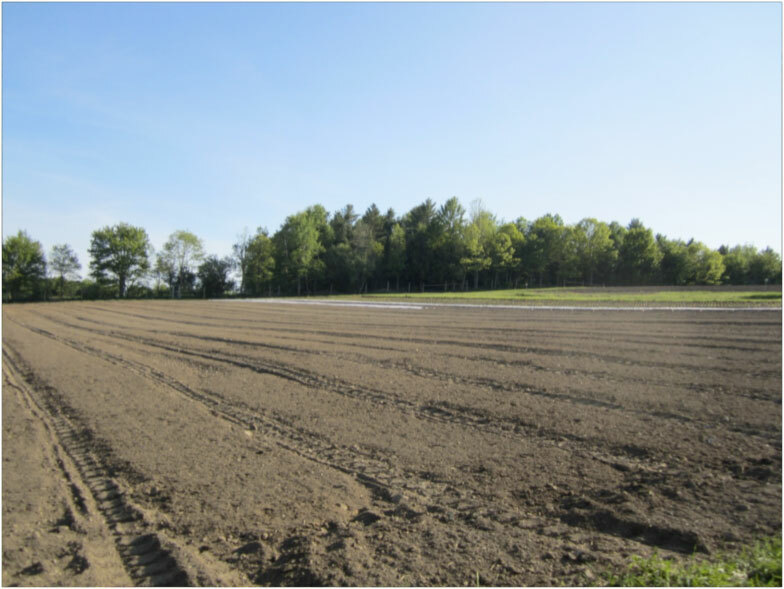 Arugula should be direct seeded, then covered immediately with lightweight row cover to exclude flea beetles which can destroy a crop in a day or two. Cross sell arugula with cherry tomatoes as a summer salad idea, or suggest that it be dressed simply with olive oil, salt, and good-quality Parmesan cheese. Arugula should not be cooked, but it is often wilted by adding it just before serving to pizza, pasta, and omelets. If you sell in an area where arugula is familiar and lettuce is old news, incorporate Asian greens and mache. Asian greens add color, flavor, and weight to salad mix. Combine with arugula, lettuce, chicory, and herbs such as parsley or basil for mesclun mix. Grown to full size, Asian greens work well in stir fry. Cross sell with carrots, cilantro, peppers, and onions as a stir-fry starter. Mache is a cool weather crop that is very popular in Europe and gaining enthusiasts in the U.S. It thrives in the late fall, winter, and early spring. In mild areas, it may be field grown and harvested throughout the winter. In northern areas it grows well in a hoophouse or caterpillar tunnel. Time plantings to have product available for winter holidays, when it is a desirable salad ingredient. That means planting in late September for harvest beginning at Thanksgiving. Mache is easy to grow, but tough to clean. Rinse harvested rosettes gently to avoid bruising the leaves. There is no limit to what you can do with greens in high-end and ethnic markets. But creativity is key. Create a unique salad mix by using specialty greens that change with the seasons. Incorporate edible flowers such as pea blossoms, violets, borage, calendula, bachelor's button, and nasturtium. Assemble mixed greens bunches for sautés, including any of the Asian greens, mustards, kale, Swiss chard, and mini broccoli. Include greens in micro mixes, where their wide range of shapes and colors and mild heat add color, loft, and flavor. Greens can be marketed at farmers markets and CSAs, especially if you provide recipes and nutritional information. Asian and Southern restaurants may be good channels for greens, as are supermarkets and wholesalers. 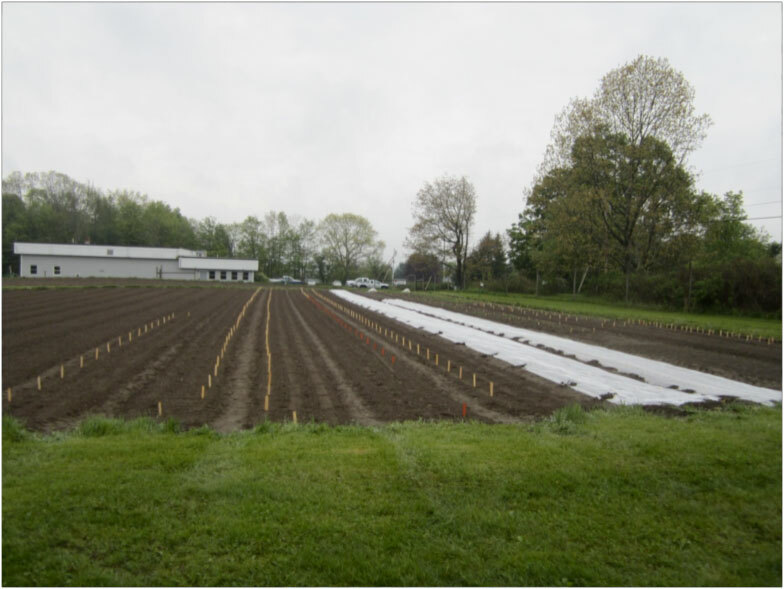 Many greens are brassicas and will benefit from a lightweight row cover to protect them from flea beetles and other typical spring brassica pests. Most do best in the cool weather of spring and fall, but some are more heat-tolerant: Yukina Savoy, which has large, crinkled leaves; Mei Qing Choi, a mini, green-stem Pac Choi; and Joi Choi, a heavy, white-stem Pac Choi. Mustard greens in general will do better in summer than the Asian greens. In addition, several other species of greens are heat-tolerant and good for spring and summer planting. Red Leaf Vegetable Amaranth is a Caribbean specialty green, often used in soups. Malabar Spinach is a climbing vine with tender leaves that are a summer substitute for spinach. Magenta Spreen is a Chenopodium, similar to Lamb's Quarter in flavor and appearance. Purslane, which has succulent leaves, is popular in Latin American cuisine and is available in golden and red varieties. Just as greens can become a foundation crop for a farm, so can salad mix. Customers eat salads year-round, so it makes sense to devote some effort to your own salad program. By experimenting with varieties, scheduling, and production methods, you will be able to offer salad mix over a long season. If you are just beginning, you can minimize the learning curve by planting Johnny's salad mix blends, available as all-lettuce mixes and all-greens mixes. Both can be harvested in 3-6 weeks. However, lettuce takes about a week longer than greens, so plant a lettuce mix first and then 5-7 days later, plant a greens mix. You should also cover the greens mix with lightweight row cover to exclude flea beetles. Both lettuce and greens mixes will be ready at the same time and you can combine them after you harvest and wash them. By using a premixed blend, you can get a feel for the production considerations. Keep good notes: amount of seed planted, spacing, planting and harvest dates, amount harvested. That information will help you make adjustments next time you plant. 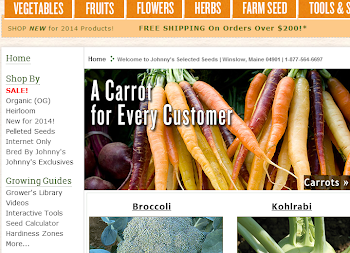 You may want to direct seed and harvest by hand at first, but if you find a strong market for your salad mix, consider investing in specialized tools: Johnny's Tilther makes fine seedbeds for direct seeding small seeds of lettuce and greens, and a pinpoint seeder is useful for evenly spacing seeds in dense plantings. For harvesting salad mix, consider a serrated greens knife for small plantings or Johnny's Greens Harvesters for larger plantings. Once you have the basic salad mix mastered, you may want to switch to choosing your own varieties and growing them individually, then mixing them together postharvest into a pleasing combination. 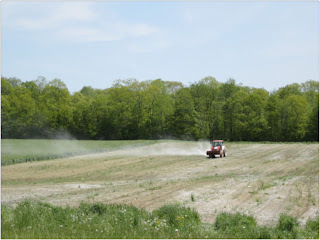 The advantage to designing your own mixes is that you can accommodate customer preference and make seasonal adjustments. Also, you can save money by purchasing individual varieties. A profitable salad mix will have several colors and shapes of lettuces for a mild flavor; baby greens for intense color, stronger flavor, and greater weight and loft; and some "signature" additions such as tender baby herbs and edible flowers. Besides being pretty, a salad mix should have a good "mouth feel," which means not too many stems or hard to swallow. And, of course, flavor should be interesting but not overpowering. Making your own salad mix is a creative endeavor! Your final consideration in growing salad mix must be washing and postharvest handling. Always use safe, potable water for washing all produce. Customers are accustomed to supermarket mixes that are triple-washed and ready-to-eat, so you may need to remind them to wash salad mix again before eating. Leaves should be spun dried gently to prevent bruising them, and salad mix should be kept refrigerated at 41˚F to as low as 33˚F for food safety and the longest storage life. Johnny's is pleased to announce the following prize winners from our winter tradeshow raffles. Hot peppers were the subject of a story published in the Lifestyle section of yesterday's Washington Post. 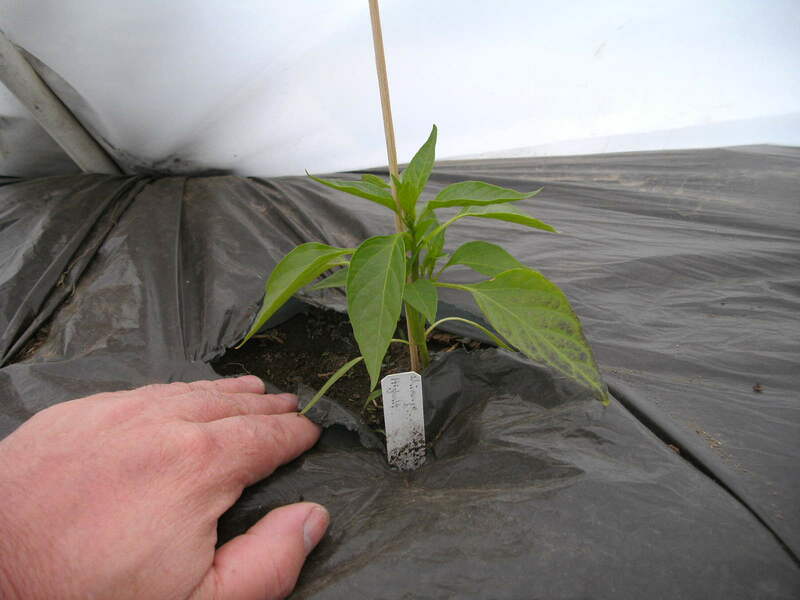 The Scoville scale system for rating heat level in peppers is explained in the article. Johnny's Chairman and Founder, Rob Johnston Jr., was asked about our own rating system, which is not quite as scientific as the Scoville system. “Steve Bellavia, our trials manager, takes a bite. Janicka Eckert, our breeder, does, too. They consult,” Rob says in the story. 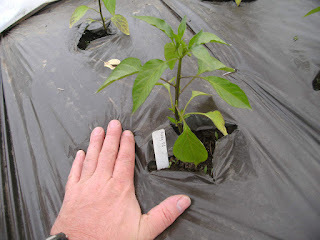 Here's a link to the article: "Growing peppers, hot and hotter". And here are some links to our peppers lineup, sorted by Johnny's 5-pepper heat scale. A pepper with a one-pepper rating denotes mild heat for tender tongues. At the other end of the scale, a five-pepper rating is considered "very hot" by us. That means a fully mature fruit will pack mouth-blistering heat. Last year, I grew dried beans for the first time. I bought one packet of Maine Yellow Eye beans, and planted them in late May, in three six-foot rows in my garden. (Johnny's has several dried bean varieties available here.) I probably planted them a little too close together, which is pretty typical of my gardening style. These are a bush bean, so they are pretty easy to grow - the only big issue I have with beans is invasions by the Mexican Bean Beetle. I've talked about these before (Click here and scroll about halfway down to see pictures.) Otherwise, as long as you keep them watered and cultivated, you can just let bush beans grow. You don't have to worry about trellising, and they won't take over the garden. Dry beans are even easier to manage than fresh beans. You just let the beans grow until they are very ripe, starting to dry out, then pick them. Last September, I picked the ripe beans (already pretty dry on the vines) and put them in a bucket. Then life got in the way, and I forgot the bucket of beans in the garage all winter. Thankfully, our garage is dry and cool, and mostly free of pests, and the beans were still there, untouched, where I left them. I rediscovered them when I went out to do some gardening this spring. So, a couple of weeks back, I shucked them, and put the shells in the compost bin. I found some desiccated bean beetle larvae in a couple of the shells, and a few beans that had been harmed by the larvae - I discarded these. 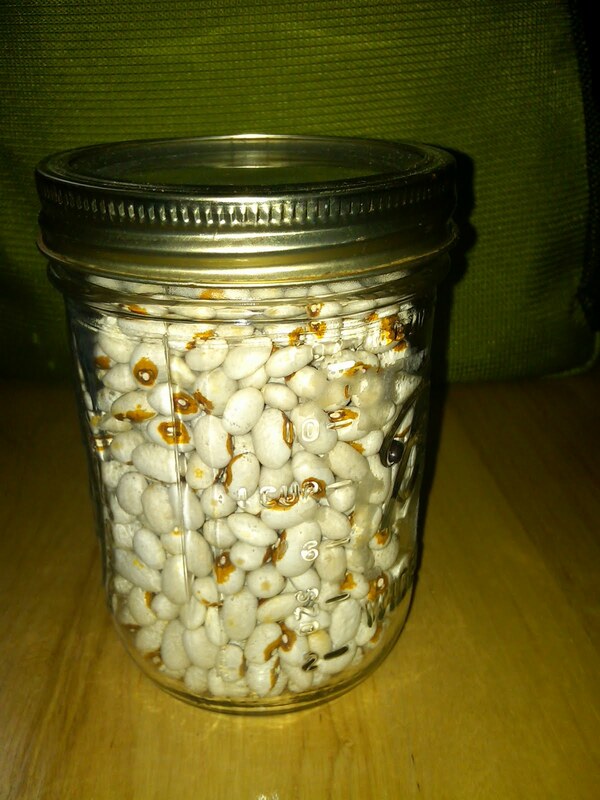 After picking them all, I had nearly filled a pint jar with dried beans. 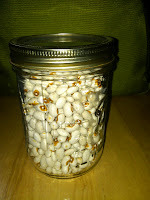 A packet became a pint (and a pint's a pound the world around) - which will become a hot and yummy pot of baked beans. Talk about some easy to quantify gardening - with fresh veggies, I know our family eats them day-to-day, and you lose count. When I can, it's somewhat easier to count jars of pickles and salsa. But counting these beans was quite literally cut and dried. 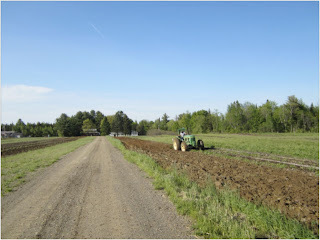 Here are a few photos of early spring activities at Johnny's Research Farm in Albion, Maine. 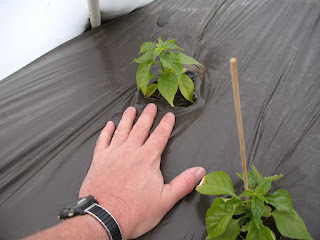 I first met John Bliss and Stacy Brenner when I was researching the viability of the Paperpot Transplanter. While this product did not make it into our line (for logistical reasons), they are big proponents of it and have integrated its use throughout their overall planting strategy. "Broadturn Farm is a CSA (Community Supported Agriculture) farm located 10 miles from Portland, Maine that raises organic vegetables, cut flowers, strawberries, a small amount of poultry, and turkey, as well as natural lamb and pork. We host weddings and events. 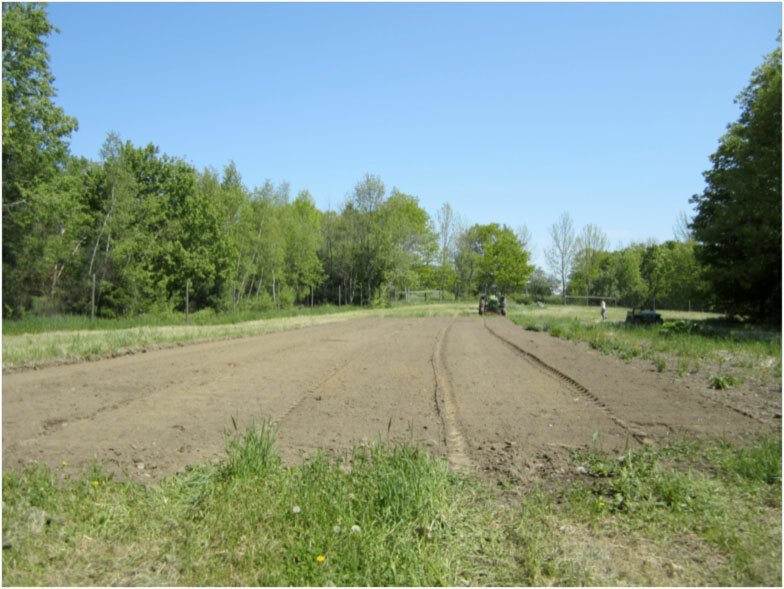 The property is in agricultural conservation with the Scarborough Land Conservation Trust. 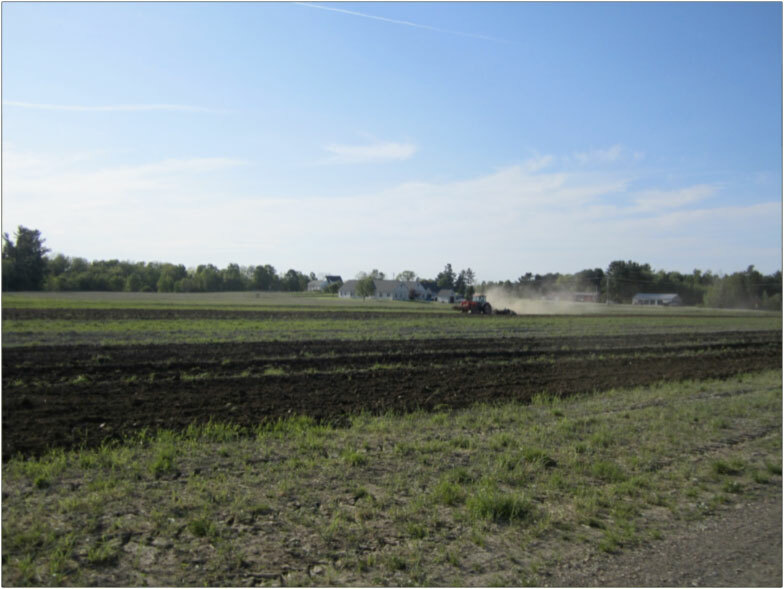 Formerly called the Keith Meserve Farm, the land is one of the largest farm properties in the Greater Portland area. It has 100 acres of open land and about 330 wooded acres." Along with the CSA and weddings, they also run a farm stand called Flora Bliss, do wedding flowers and cut flower design for events, and have a farm camp in summer. Am I missing anything? Probably. They've got a lot going on. The construction of caterpillar tunnels at Broadturn Farm was initiated due to a partnership involving offsite trialing of flower varieties for Johnny's Selected Seeds. 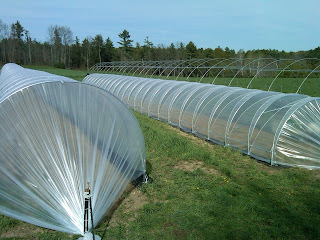 I was asked to support this partnership by managing the construction of a caterpillar tunnel on their farm. I saw this as a unique opportunity to develop instructional videos for our Quick Hoops Bender line, so we decided to build a fixed tunnel and a moveable tunnel. The end goal would be making these videos available for free download on our website. We still have some minor filming and a bunch of editing to do, but we hope to get these videos out to the public soon. This was every bit a trial as any of our projects have been, as both these tunnels were much longer than those we had previously built. Extra length brought with it some unique challenges, including the need for more secure T-posts at the ends of the tunnels and a need for more hands to hold down the plastic when skinning the tunnel. I also took this opportunity to try out some design modifications, which included building the fixed tunnel on taller ground posts. This really changed the structure substantially in size, feel, and thermal performance, and instantly made it accessible with a small tractor. This was (as always) a great learning experience, and we were able to accomplish this with two days of pre-fabrication in the Johnny's trial farm shop, followed by three separate days of on-site construction. Special thanks to the Broadturn Farm Crew, including owners Stacy Brenner, John Bliss, Emma, and Flora, and their great crew, Andrea, Maggie, Clint and Nick. Thanks to Johnny's employees Jeff Young, Matt Giroux, Russel Prime, and Hillary Alger for their hard work in the construction of the tunnels. Thanks also to Angela DiMillo for her work behind the lens, and to Patti Lennon and Christina Hillier for their support on this project as well. 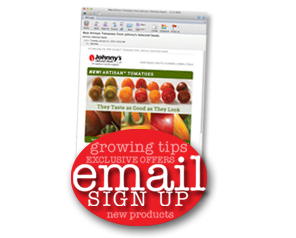 We love to hear your feedback and encourage you to share your progress and questions throughout your growing season. 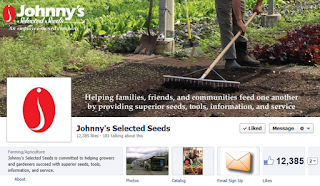 We're asking you to help us grow the Johnny’s Facebook community to 13,000 “likes” and we’ll share a FREE STANDARD SHIPPING offer code that will be valid for 5 days (US addresses only). 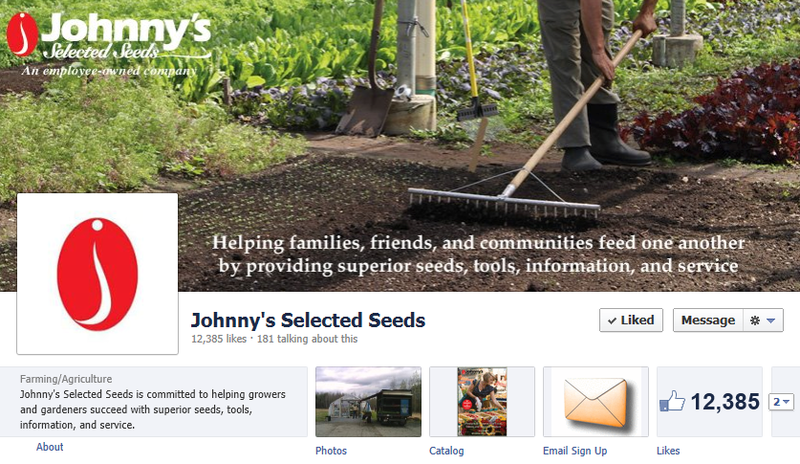 The Johnny's Selected Seeds 2012 Tools and Supplies Catalog is now live on our website. 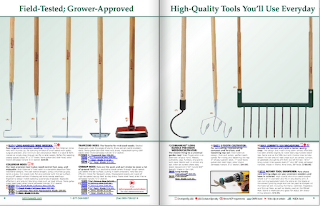 This new catalog contains tool products and information for starting seedlings, organic insect control, weather tools, mulches and much more. Click here to view the catalog.